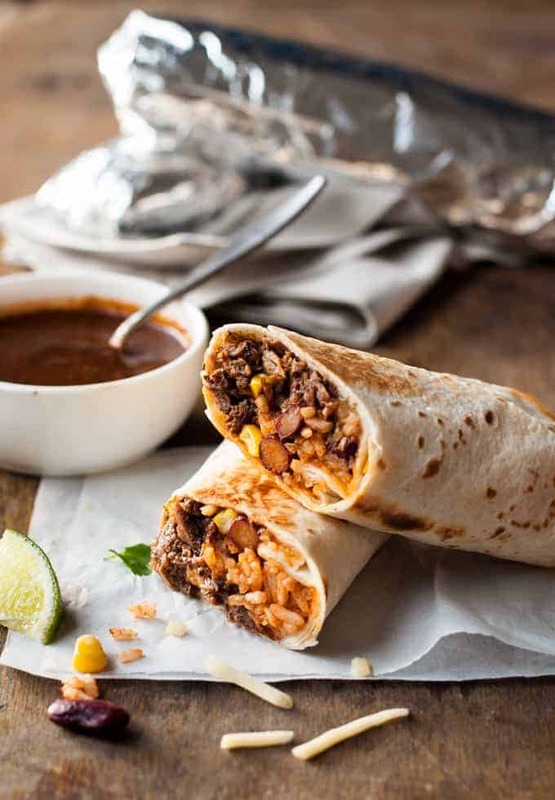 Freezer standby meals don’t get any better than this – burritos filled with Mexican Shredded Beef in a rich, thick sauce, and stuffed with Mexican Red Rice and cheese. SO GOOD! 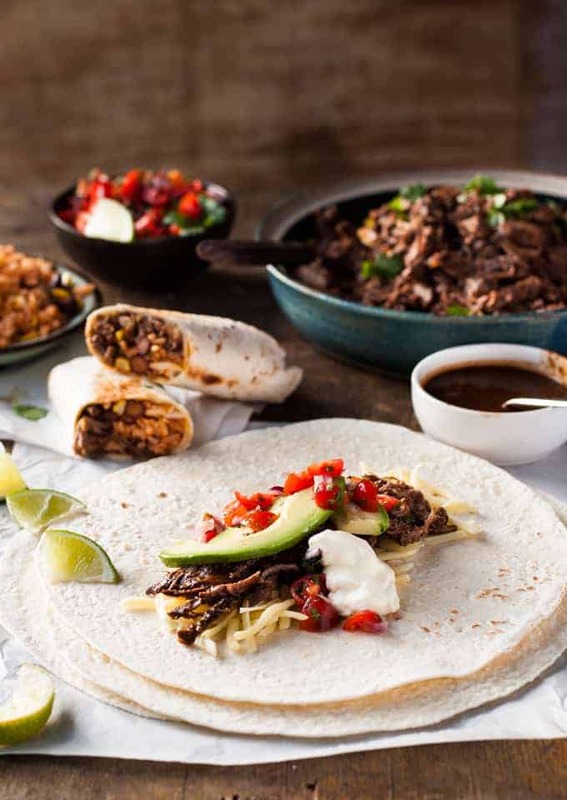 You will love this Shredded Beef Burritos recipe. The recipe for my Mexican Shredded Beef makes a LOT of beef. When you shred meat, it always makes it seem like so much more which is a good thing because it goes further! Look at this mound of goodness……. I stuffed my burritos with the shredded beef, cheese and my Mexican Red Rice. Have you tried it? I think it tastes just like the rice you get at restaurants! I make it a bit differently to other recipes you will find….because I make it like fried rice! Using Enchilada sauce and Mexican spices instead of soy sauce and other Asian condiments, and “stir frying” cooked rice. It works really well! There is a bit of an art to rolling burritos. I must admit, I struggle. I blame my hands. Bay Hands (i.e. abnormally small hands) are NOT made for rolling up generously stuffed burritos! Here’s how I roll them. The little extra step I do is using a knife (blunt side down) to help keep the stuffing in place while I pull the bottom part of the tortilla over the filling. I’m pretty sure that people with larger hands will not need the knife! But here’s a photo of a non-freezer friendly burrito, in case that’s what you want to make! I’ve included some notes in the recipe too. Microwave half the tortillas very briefly to warm them up (15 seconds or so). This ensures they don't crack when you roll them. Place 1 tortilla on a workbench - cover the rest with a tea towel to keep them warm. Place cheese down the middle of the tortilla, then top with 1/3 cup of beef then 1/4 cup rice. 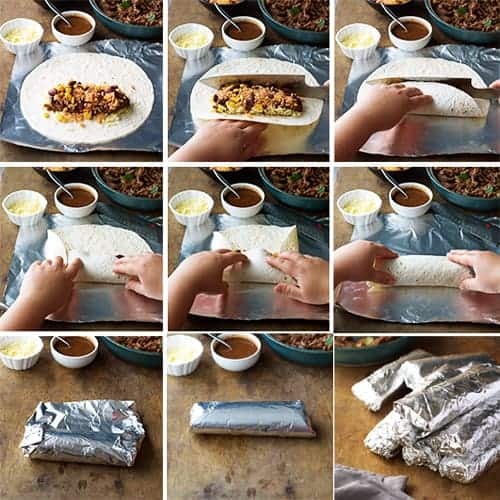 Roll the burrito up. (Note 2) Wrap in foil to hold it together. If you are serving it immediately, heat a skillet over medium heat. 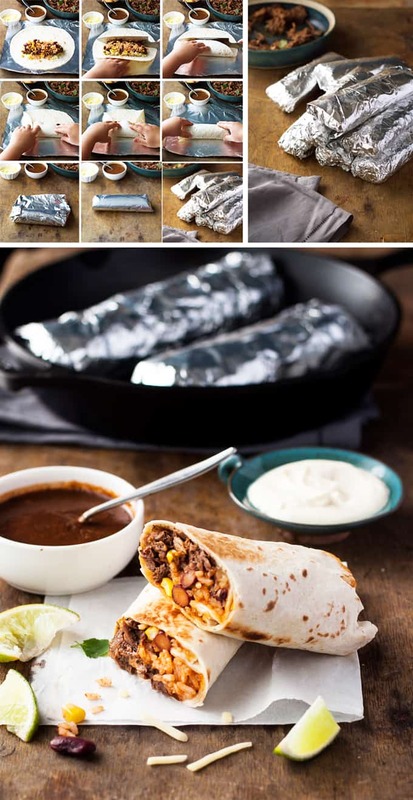 Cook the burritos for around 4 to 5 minutes on each side to make the tortilla brown and heat the inside through. If freezing, place in the freezer. To reheat, you can either bake from frozen (with foil on) at 350F/180C for about 40 to 45 minutes, or thaw and cook in the skillet per above. You could microwave it (remove the foil) but I like my burritos a bit crispy! 1. If I make the Mexican Shredded Beef ahead of time or a freeze it, I keep the sauce separate so the beef doesn't get too soggy. 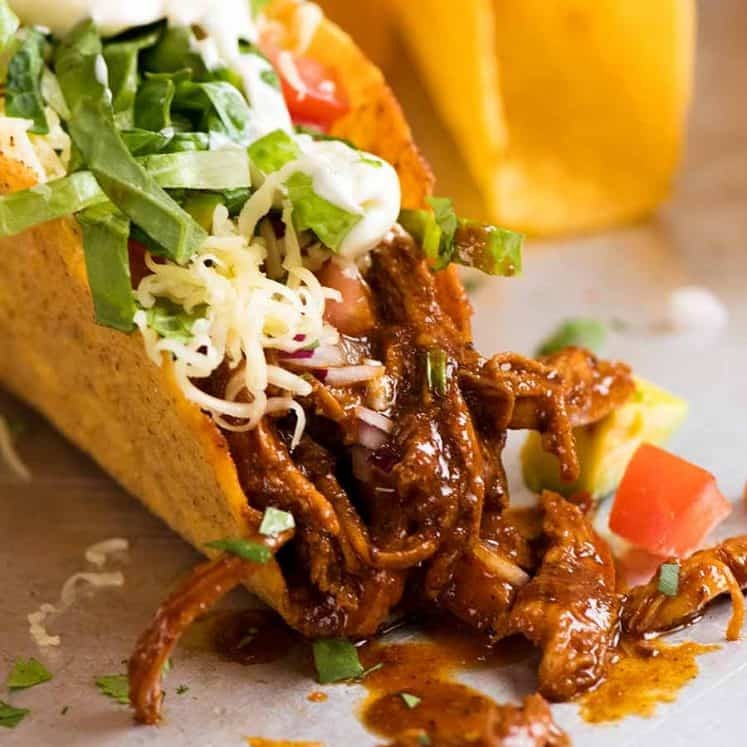 To make the burritos, you can either toss the beef in the sauce or you can simply drizzle sauce on the beef when you place it on the tortilla. 3. This is how I roll a burrito - I am not very good and I put that down to having small hands! If you are stuffing the burritos with a lot of filling, like I usually do, I find it handy to use a knife to help hold the filling in place as I fold up the bottom. No nutrition today. Too difficult to calculate because this uses 2 recipes! Made this with your Pico de Gallo and Mexican rice. Absolutely awesome!! 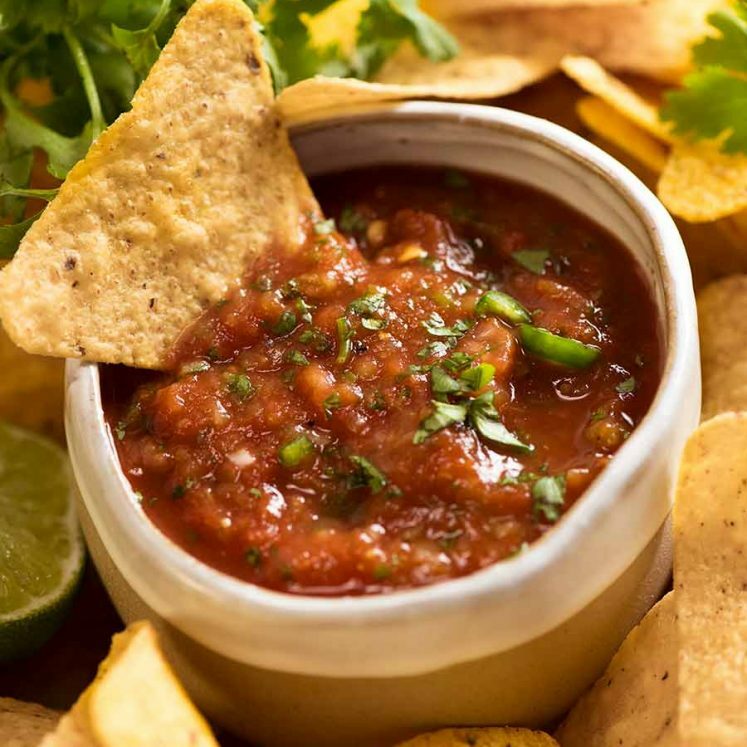 Your Mexican recipes are second to none! I have cooked a different one for the last 5 Saturday night dinners and each week we decide we have a new favourite! Just loving trying these new flavours – Thanks Nagi. I made the shredded beef which was delicious and now can’t wait to make it into burritos. Thank you for the delicious recipes! I’ve made about 20 from your website, and they are all outstanding! Your attention to detail is appreciated Nagi. I have made 2 batches of freezer burritos now, but using your pork carnitas recipe. They are just the best thing for lunches! I will tell anyone who will listen how amazing they are, just ask my husband. My favourite way to reheat them is straight out of the freezer and into a sandwich press for 30 minutes. The tortilla gets nice and crispy and they are really stable to eat – no risk of falling apart (trust me, I’ve eaten PLENTY in the car!). What brand of tortillas do you use, those look much better than the ones I’ve been using? Can’t wait to try these! Thank you! These were SO delicious! What do you think would be the best way to reheat these? I really enjoy making them, makes the tortilla nice and crispy! Do you mean microwave them? Hello 🙂 I think perhaps Nagi meant “baking” them. That method would make for a crispier crust than microwaving. 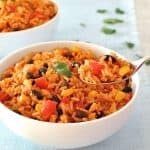 Hi, Rather than using enchilada sauce for the red rice, do you think it would be ok to use the sauce from the beef? Too much of a good thing or one less pan to wash? ? For sure! I think it will be amazing! I’ve made this twice now and it’s fantastic!!! I too had trouble (laziness) getting Chipotle powder… I grind up a whole dried one. Perfect! 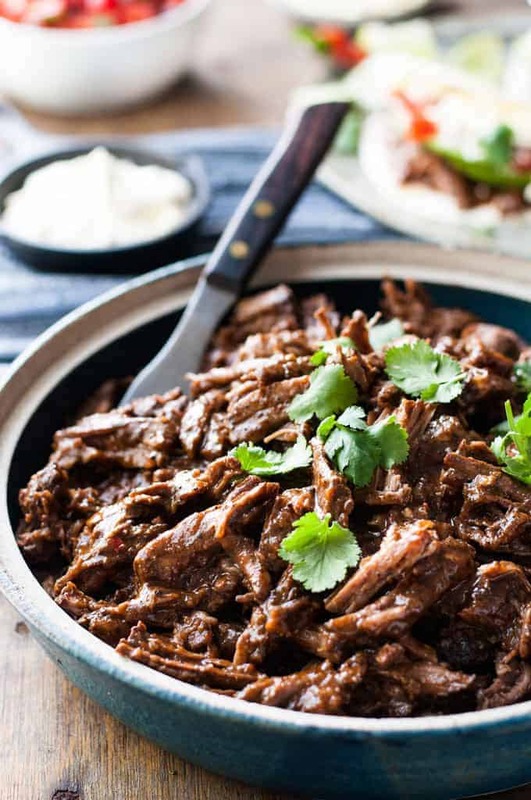 Nagi – would these work with the shredded mexican chicken instead of beef for freezing? I love that they are freezer friendly. That is really cool. Tex Mex has to be my favourite type of cuisine. I’m making these for my boyfriend to keep in the freezer at work (he always forgets to pack a lunch!). What’s the best way to reheat one in a microwave? PS: Fresh burritos with your pulled pork carnitas are my favorite! Hi Jenny! Your boyfriend is one lucky boy!! 😉 I use the defrost setting on my microwave to reheat from frozen. Does he have that? It gives me a guide for time and uses a lower heat level. 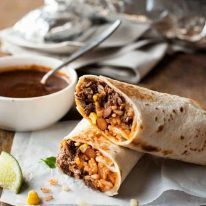 Never had Burrito’s before, sounds strange I know but I’m glad I tried them and freezer friendly to boot, love the slow cooked beef, delicious, spicy rice, heaven! Cheers Nagi another great recipe!